[Infographic] How Ready Is Your Startup For Success? You must have heard about this stat (if you ever drew chairs in the inner circuit of entrepreneurial world.) that says 90% of all startup fail. They fail because they ran out of money, citing issues with the destiny (where they failed because their services did not turn out to be what they wanted, period), or their products were simply not needed in today’s world. In either cases, it is important for businesses to evaluate their strategy early at the stage, at their infant stage, as in when they are truly called Startups. This makes sure that startups do not tread on a path destined to doom. As they say, a stitch in time saves nine. 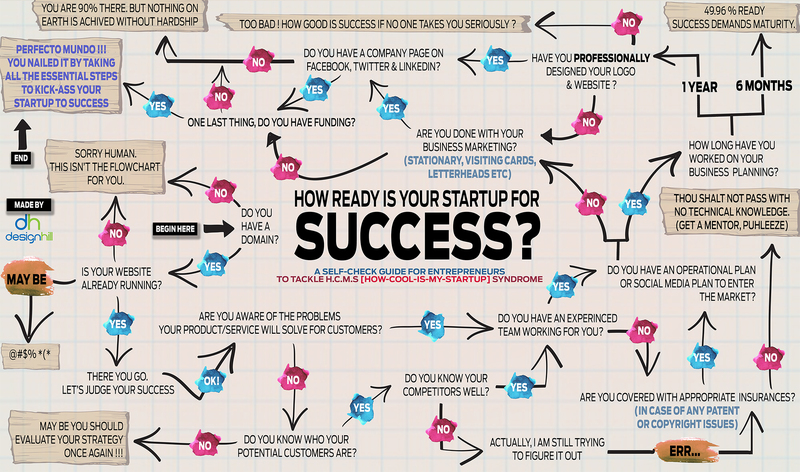 Check out our infographic on deciding how ready is your startup for success. A series of question, on the basis of your choices, will leave you to a conclusion determining your startup success. You are at your worst if you end up finishing your quiz under 4-5 questions, and works best if you go through all the questions on the grid. Work yourself anti-clock wise starting from the middle (Look out for BEGIN HERE word) and share us with your results in the comment section below. How Ready Is Your Startup For Success? Like our infographic on How Ready Is Your Startup For Success? . Print it or post it directly on your site, using the options below!